I’ve made a lot of hummus over the years. When I’m in a rush, I use canned chickpeas, throw them in the processor and in five minutes, I have a pretty decent hummus that is miles ahead of any of the tubs of supermarket hummus you can buy. But, if you want to make a really spectacular hummus, you have to soak and cook your chickpeas until meltingly soft, throw the still warm chickpeas in the processor, add a big glup of tahini, some garlic crushed in salt, lemon juice, a glug of olive oil, process, taste and adjust the flavours… and there you have it: a spectacularly good and, dare I say, even great hummus. A couple of years ago, there were a whole slew of recipes online promising the creamiest, silkiest hummus ever. The only catch was, that you had to peel your chickpeas. That’s right: each individual chickpea had to be individually popped out from their skin. To be honest, I kind of resented the entire idea of peeling chickpeas. Would the hummus makers of Jerusalem and Beirut, with their lines of customers around the block, be bothered peeling their chickpeas? No! It all seemed a bit self-indulgent. I resisted for a long time but as a hummus obsessive, I felt I had to try this chickpea peeling thing at least once and see if it was all it was cracked up to be. So, I did and, despite my cynicism, I had to admit it did make a spectacularly, silky smooth hummus which was a big hit with my family… but… it was also a total hassle, particularly, if you want to make a decent amount of hummus. It can take quite a tedious time to peel chickpea after chickpea. Also, despite the fact it was silky smooth, waiting for the chickpeas to cool enough to peel them (and hence dehydrate a bit) meant there was a slight loss of creaminess. But once this chickpea peeling genie had been let out of the bottle, every time I made hummus, there was always this dilemma to peel or not to peel and I would veer between peeling or not peeling, before deciding the whole peeling thing was too much bother and I just stopped. Then, a few weeks ago, I came across this neat technique for peeling chickpeas in a Youtube video recipe for Fatteh from Taste of Beirut. You simply soak the chickpeas overnight, drain them, then spread them out in a single layer between two tea towels and roll over them with a heavy rolling pin. This causes most of the skins to magically pop off. Then, when you cook the chickpeas, the rest of the loosened skins will rise to the surface and you can just skim them off. What you end up with is melting soft, cooked skinless chickpeas that make a fantastically, silky, smooth and creamy hummus that really could give the master hummus makers of Beirut and Jerusalem a run for their money. 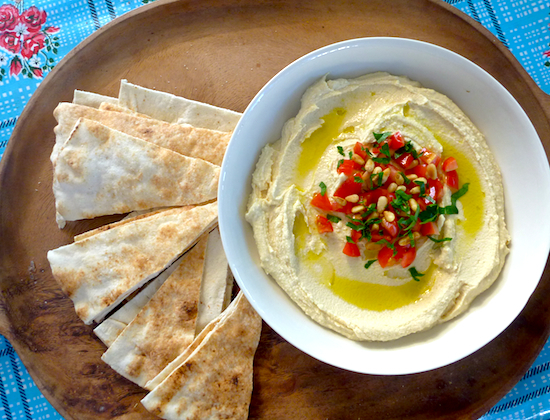 I don’t really use a recipe when making hummus but this one from Paula Wolfert is a nice and simple one to start with. To garnish: a combination of any these options – olive oil, finely chopped parsley, toasted pinenuts, tomato seeded and finely chopped, sumac or paprika. Drain and place soaked chickpeas in a single layer between two tea towels. Roll over the chickpeas with a heavy rolling pin, until skins pop off, pick out skins and discard. Place chickpeas in a pot with water about an inch above them. You may need to replenish the water as the chickpeas cook. Bring to boil and reduce to a low simmer, gently stir the chickpeas and skim off any remaining skins that come to the top. Cook the chickpeas for 30 minutes to an hour, until very tender. Drain chickpeas and reserve liquid. Let chickpeas cool a little, then place in food processor. Grind chickpeas to a paste, add crushed garlic, tahini lemon juice, and a glug of olive oil and process until smooth and creamy. Taste and adjust seasonings. If the hummus is too thick, add some chickpea broth a little at a time, until the hummus reaches the desired consistency. To serve, swirl onto a shallow plate, drizzle with olive oil and garnish with parsley, sumac or paprika, whole cooked chickpeas or finely chopped tomato and toasted pinenuts, if desired. What an excellent tip – though I can’t imagine I’ll be peeling my chickpeas anytime soon. 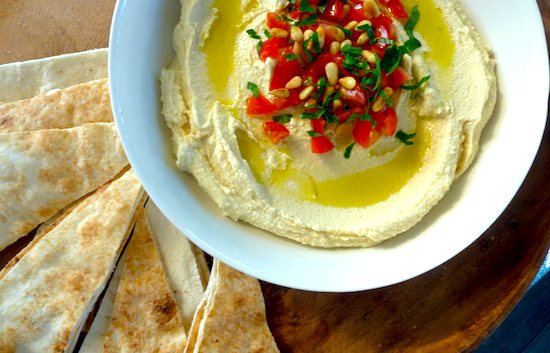 When I make hummus, I like to throw a little jalapeño in there – yum! I make excellent hummus, and a few times, I have taken the time to peel my chickpeas, but do not do it on a regular basis. I appreciate your tip for making this time-consuming task go a little faster!. There are more peeled chickpeas in my future! It’s great trick, peeling chickpeas wears thin after a while. Soak and precook your chickpeas? I’ll have to try that technique! It’s not really that much trouble and it does give you spectacular results. 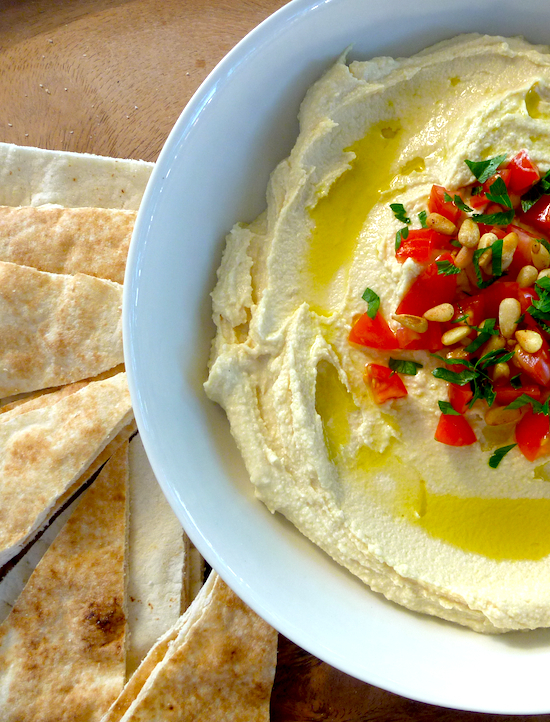 I have made Yotam Ottolenghi’s hummus many times and thought it pretty good. It was never as brilliant as this. I did think teasing off paper thin chick peas skins was a tad tedious, as I painstakingly sieved them out of the simmering pot. But, Elizabeth, you are quite right. The resulting texture is unlike every dish of hummus I have ever made. Thank you for all you lovely shared food experiences.